Ahmedabad’s bus rapid transit system served as a model for Indore’s new iBus. Photo by Meena Kadri. During my first visit to India in 2006, I presented Latin American experiences with Bus Rapid Transit (BRT) at a conference organized by the Indian Ministry of Urban Development. At that time BRT seemed a distant dream for the Indian context; now it is a reality for several cities and an imminent possibility to many more. Over the past four months, two cities in the Indian state of Madhya Pradesh launched their Bus Rapid Transit systems. Indore, the state’s commercial hub, began trial runs in April, is already operating commercially, and is expected to officially launch in the next two weeks. Bhopal, the State capital, quickly followed suit, beginning trial runs of the new system on June 1st. These two cities join Pune, New Delhi, Ahmedabad, Jaipur, and Rajkot, bringing the total count of India’s BRT systems and bus corridors to seven. Two additional cities, Surat and Pimpri-Chinchwad are expected to launch their own advanced bus systems later this year. Five more cities have BRT lines under construction, and an additional five have announced future plans to build such a system. In less than a decade, the number of BRT systems and bus corridors in India will have gone from zero to nineteen. Key to this rapid spread of advanced bus systems has been strong local leadership and national technical and financial aid. 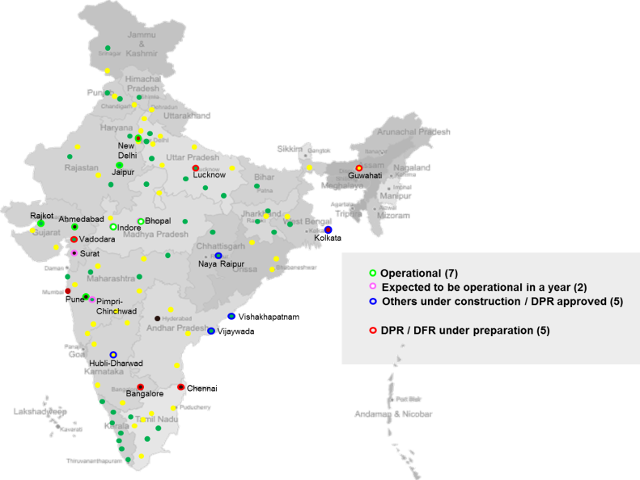 Bhopal and Indore both benefited from the support of the Jawaharlal Nehru National Urban Renewal Mission (JnNURM), an ambitious national government program to support urban development and reform across a rapidly urbanizing country. The growth of advanced bus systems in India has also benefited from the support of academic institutions like CEPT University and IIT Delhi and a wealth of international expertise shared through multilateral institutions and NGOs, including UNDP, the World Bank, the Asian Development Bank, EMBARQ, ITDP and Clean Air Asia, to name a few. The Indore BRT corridor, iBus is an 11.4-kilometer (7 mile) corridor with 21 median stations, and custom-designed air conditioned buses. It is currently carrying over 19,000 passengers per day and is expected to serve more than 70,000 once the fleet of 50 buses is completed. The corridor has all the necessary features to be considered a full BRT system: bus stops in the road’s median, stations with prepayment and level boarding, good quality buses, information technologies and a distinctive image. iBus Station Interior. Photo by Prashanth Bachu. The plan for Indore’s bus corridor was approved in October 2006 and after overcoming multiple financial and legal challenges, it initiated trial runs this past April. As seen in many other projects, the system started as a “work in progress.” The advanced wireless-solar signaling system has yet to be implemented, and the full bus fleet is not yet up and running. But already, the experience of riding Indore’s BRT is a big change for users: buses flash through the congestion on the Agra-Bombay Highway (a large, interstate highway, known as the AB Road) providing the fastest way to travel across the city. Very shortly after the launch of the system in Indore, Bhopal started the trial runs of a section of its 23 km bus corridor. The MYBUS system, also funded by the national JnNURM program, features central bus lanes, island stations, and low floor buses. According to initial measurements, the commercial speed of Bhopal’s MYBUS is 27% above the average on the general traffic lanes, providing users with a quick ride across town. Completion of the full corridor is expected in the next three months. During my visit to these two systems in Bhopal and Indore, you could see that the new advanced bus systems give citizens a reason to be proud of their city. Progress comes in the form of good quality public transport. 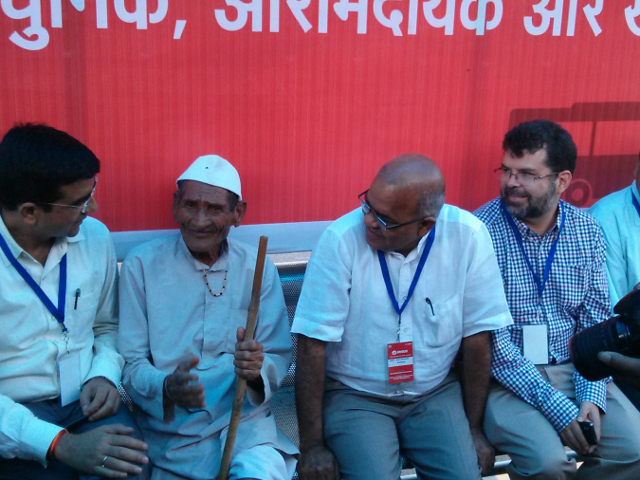 Chandramouli Shukla, Prof. Shivarand Swamy and Dario Hidalgo chatting with a station user during MYBUS trial runs. Photo by Amit Bhat. 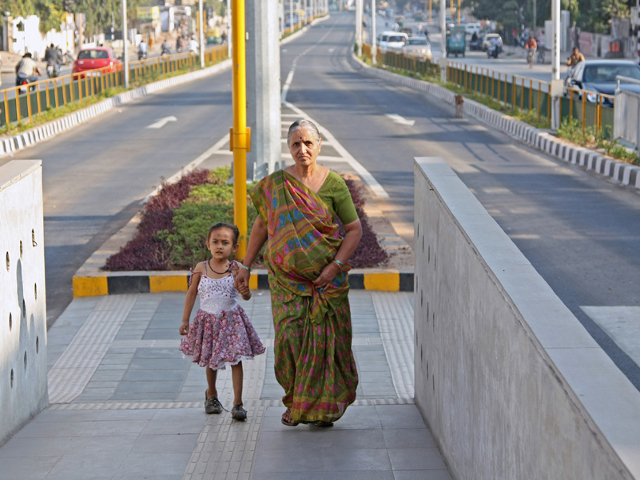 Will these systems spark mainstreaming of BRT across India? 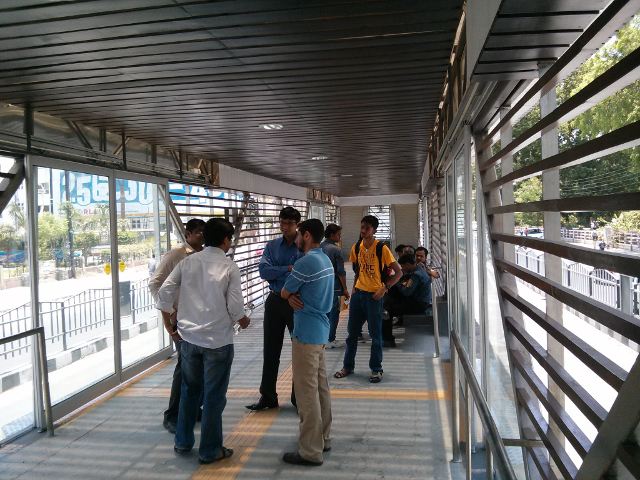 It is still too early to declare Madhya Pradesh’s first two BRT systems a success. But they have very strong characteristics and show that it is possible to adapt the BRT concepts in different contexts. In 2011, Ahmedabad started the operation of a section of its 45 km Janmarg system (with plans to expand it to 108 km within three years). When the Janmarg system was presented in other parts of India, some people said it was not possible outside the State of Gujarat. Now, two advanced bus systems are operational in Madhya Pradesh, with systems under construction in Naya Raipur, Hubli-Dharwad, Pimpri-Chinchwad and Surat, and on the drawing board in Mumbai and Bangalore, among others. Though India was slow to begin investing in BRT Systems, I believe we are witnessing a “tipping point.” Bus Rapid Transit in India is finally taking off.